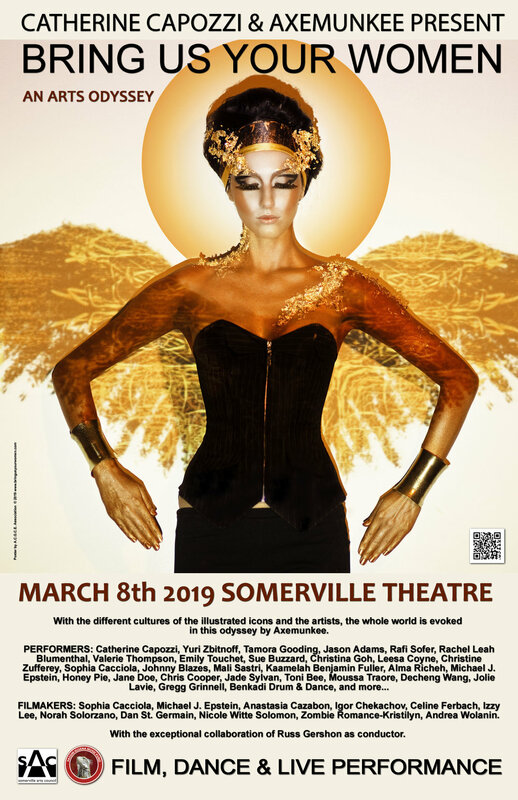 Somerville, MA—On Friday, March 8, International Women’s Day will be celebrated locally with global fanfare through Bring Us Your Women: An Arts Odyssey (BUYW) at the Somerville Theatre. This woman-created, multimedia spectacle features performances and works by 40 artists from France, Switzerland, Mali, Côte d'Ivoire, China, Ukraine, Netherlands, and the US honoring diverse female icons. Universal and timeless stories are reimagined through film, music, dance, and poetry. From Eve to Ishtar, Joan of Arc to Kali, and more, these unique retellings aim to inform, empower, and inspire. In times of war and conflict, “Bring us your women” is uttered to establish dominance, instill fear, and subjugate. But underneath is a recognition of women’s strength and essential role in society, whether a neighborhood or a nation. Bring Us Your Women echoes that recognition and expresses reclamation at a time when women around the world are reclaiming their power. “By revisiting the journey of these ancient female figures in a fusion of artistic devices, this show allows us to rediscover part of our universality, sovereignty, and influence in the present world,” said Christina Goh, a BUYW organizer and performer. For this third rendering, Capozzi and the BUYW collective are expanding collaborations and actively engaging the community. New sponsorship opportunities give local businesses and individuals access to VIP seating, exposure, and other perks in exchange for helping to offset artist travel and production costs. Local organizations are granting funds for lighting and sound expenses. The Somerville Theatre is running the event trailer before current movie screenings and is developing a relationship with organizers for potential future performances. “We are thrilled to be able to host a locally produced show with a worldly mindset—the showbiz equivalent of think globally and act locally,” said Ian Judge, director of operations for the theater. All are welcome to do the same by attending. March 8; Doors 7:30 p.m.; Showtime 8:30 p.m. Tickets are $20 (plus $1 restoration fee) at Somerville Theatre box office or online (other fees apply).